Tightrope walker, Nik Wallenda, plans to walk a tightrope across Niagara Falls this evening, June 15, 2012. 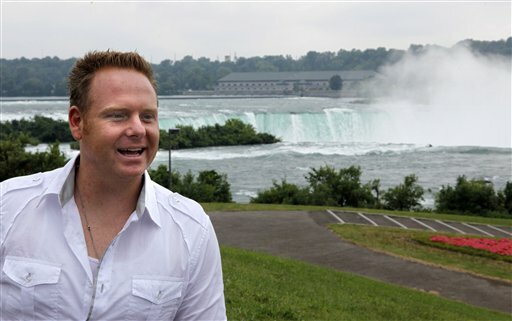 All eyes are on Niagara Falls to-day as Nik Wallenda attempts to walk across on a tight rope. The hype has been intensifying, and tourist bureaus on both sides of the border are using this courageous stunt to showcase the marvel of the Falls and many other tourist sites in the region. For many in Southern Ontario, no summer is complete without a visit to Niagara Falls and to Stratford for the Shakespeare Festival. Yesterday, after a lapse of several years, we went to Stratford. We travelled in a convoy of three luxury coaches, had lunch at the deservedly famous Church Restaurant, heard a scholarly lecture about courtship and marriage in Shakespearean comedy, and saw a wonderful new production of Much Ado About Nothing at the Festival Theater (review here)… all in the company of McMaster Alumni. It was a perfect June day and the agricultural countryside and beautiful parklands were spectacular in the bright sunshine! I can’t imagine missing this summer tradition ever again. The play was set in Brazil, in Edwardian costume, on a set which transformed the iconic thrust stage of the original Festival Theater with a magnificent curving staircase to the upper balcony! There were music and dance, a screen scene that made wonderful use of the staircase, and a truly impressive troupe performance. It never ceases to amaze me how clever producers and designers can take a well-known story and recast it so that it is fresh and novel and yet still faithful to the original text and narrative. Perhaps it is because a classic plot and authentically convincing characters are, in themselves, timeless and unrestricted in location; although now that I think of it, the castle or huge estate or battle encampment, some very large but enclosed social environment, seems essential for the setting. 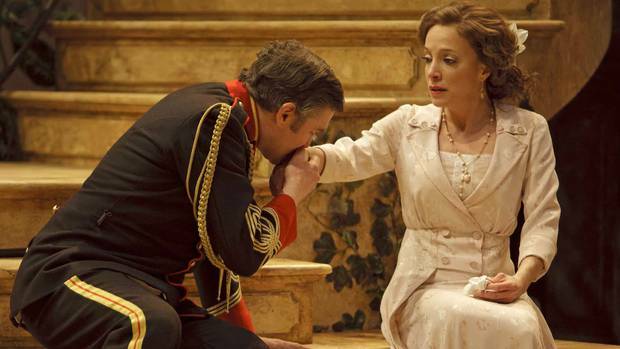 I was a bit nervous about seeing Much Ado About Nothing, even at Stratford, because I could not imagine anything standing up to comparison with the Kenneth Branagh film! Who could ever come even close to Emma Thompson’s portrayal of Beatrice, or Branagh’s Benedict? It is still my favourite film version of Shakespearean comedy, but nothing can replace the excitement and deep concentration of a live performance. The same is true of live and recorded music. I hope the mass media productions never drive out the intimacy and immediacy of the live performance. If you haven’t seen the Branagh production, do borrow or rent it. I have linked the trailer above, as embedding much of the film has been disabled. On YouTube you can find the film divided into segments and watch most of it. This is how it opens, before the troops arrive to interrupt the idyllic picnic, and put to the test the meaning of Emma Thompson’s (Beatrice’s) ironic poem. As usual, we are “home” this summer… in this part of the world that means one does not own a “cottage” on one of the lakes. These are often no longer “cottages”, but luxurious second residences with all the amenities, and all the responsibilities, of home. Unless you inherit a summer property that has been handed down through generations, only the really rich can even dream about a “cottage” in Muskoka, or anywhere near Georgian Bay. If you are lucky though, you may have hospitable friends who undertake, not just to get away to the cottage, but to entertain every weekend. A couple of years ago I spent a week at a friend’s cottage on Manitoulin island. The primary access is by taking the ferry, The Seguin, from Gravenhurst, a thrilling trip through some of the most beautiful scenery in the world. We have also camped in Algonquin Park and several other wonderful national and provincial parks. When the children were younger, trips to the Toronto Zoo and the Ontario Science Center were also summer treats. We are within easy driving distance of Lake Erie, Lake Ontario, the Grand River, the Royal Botanical Gardens, the African Lion Safari, the Niagara Bench (with its wineries and tourist towns), St Jacobs (with its Mennonite traditions and wonderful shops) and Canada’s Wonderland. Mid-August the Canadian National Exhibition opens. We have not visited the Butterfly Sanctuary yet, or seen the Royal Ontario Museum since its drastic renovation. In this multi-cultural society, we can eat our way around the world in small restaurants serving authentic ethnic food. We can drive in to Toronto or get there quickly on the GO train. In addition there are summer concerts, the opportunity to explore sections of the Bruce Trail, and the new Waterfront Trail along Hamilton’s Bay front and Lake Ontario shoreline. This year is also the anniversary of the War of 1812, and here in Hamilton we live near the sites of some of the most important battles that kept us out of the United States! There are special events planned to commemorate these events, and I should do some more reading about it as well! I also want to sew, and sew some more, to read, and read some more, to nap and eat in the garden, and to see my friends. My birthday is the first day of summer… and while summer is a gift to all of us, my gift to myself will be to enjoy every minute of it! This entry was posted in Uncategorized and tagged drama, film, Hamilton, Niagara, Ontario, summer, travel. Bookmark the permalink. I have a friend who had a summer home on Stoney Lake near Peterborough and I spent several weekends over the years at that lovely(!) place. But it was certainly hard work for them – all week in Toronto and then entertaining every weekend at the lake. I suppose the goal for many cottage-owners is to eventually retire there. I know that is the case with the ocean front (and area) second homes here in Nova Scotia. I LOVE it when a production of a classic is in an unconventional setting. My first experience with the concept was seeing (at ArtPark) the opera “Carmen” set during the Spanish Civil War. It was marvelous! I went to ArtPark a great deal when I lived in St. Catharines, but not so much when we moved to Hamilton. That was a shame, really, because it’s not that much further to travel.